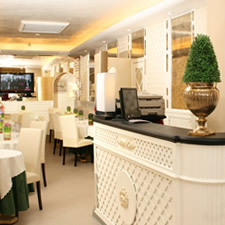 The Hotel Valle in Rome is located very near the Metro Stop Cavour which is only 1 stop or 250 metres from the Colosseum, Imperial Roman Forum and the ancient heart of Rome. Ideally situated the Valle is perfectly positioned so as to leave all of Rome’s most important attractions only a short walk away. The main railway station Termini which is also the airport terminal for Ciampino and Fiumicino is located only 300 metres away making the Valle Hotel the ideal accommodation for those arriving in Rome by plane or train. By Air: (Ciampino or Fiumicino Leonardo da Vinci) From Ciampino we suggest you take the Terravision shuttle bus which runs frequently from Ciampino to Termini and drops you off on Via Marsala i.e. the wrong side of the station from where we are! 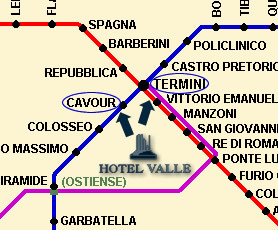 Nevermind, from here you can either walk right past the station to the other side and then take Via Cavour or you can take the Metro Line B (see above) Similarly, if you arrive at Fiumicino take the Leonardo Express train to Termini and again either walk down via Cavour or take the Metro. By Car: We don’t suggest driving in Rome as it can be quite a hair raising experience however, if you insist on bringing the car then here are the directions: take the G.R.A. Grande Raccordo Anulare in the direction of Fiumicino Airport Civitavecchio, from there take the exit number 6 and follow the the directions for Roma City Centre, then follow the signs for Termini and Via Cavour. By Train: (Termini train station) Either walk the 300 metres from the train station down Via Cavour until you reach our hotel (located half way down Via Cavour on the left) or you can take the Metro Line B 1 stop to Cavour. Try to get in the first 2 carriages of the Metro as that will let you off directly in front of the exit for Metro Stop Cavour. Climb the first flight of steps go left, climb second flight of steps and go right, proceed 25 metres until you get to the Hotel Valle.